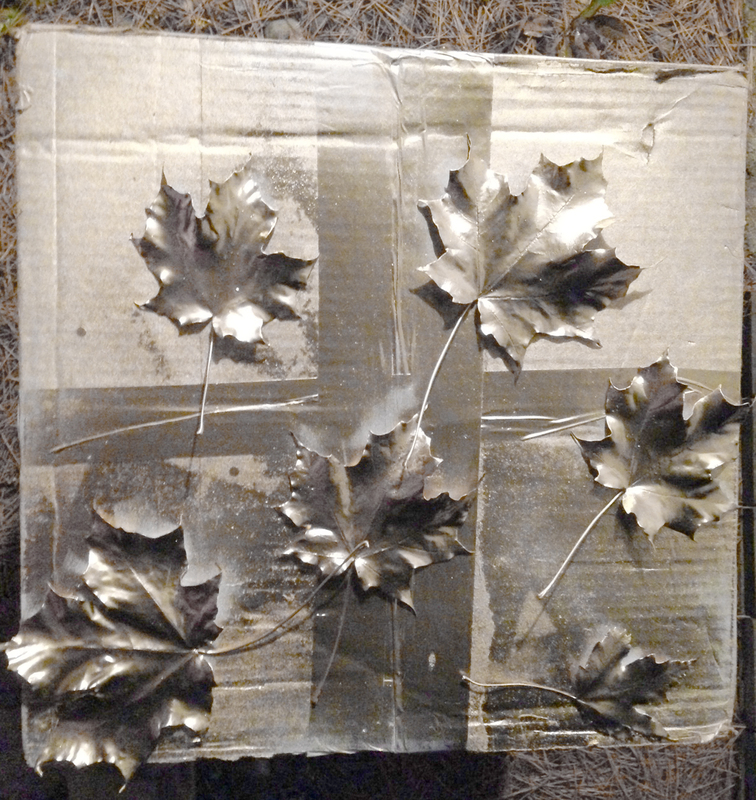 My DH brought me home some gold and silver metallic spray paint because I mentioned it would look cool to paint maple leaves silver or gold. A couple of days ago I asked him to buy some blackboard paint and he came home with 2 cans of the gold and metallic paint. 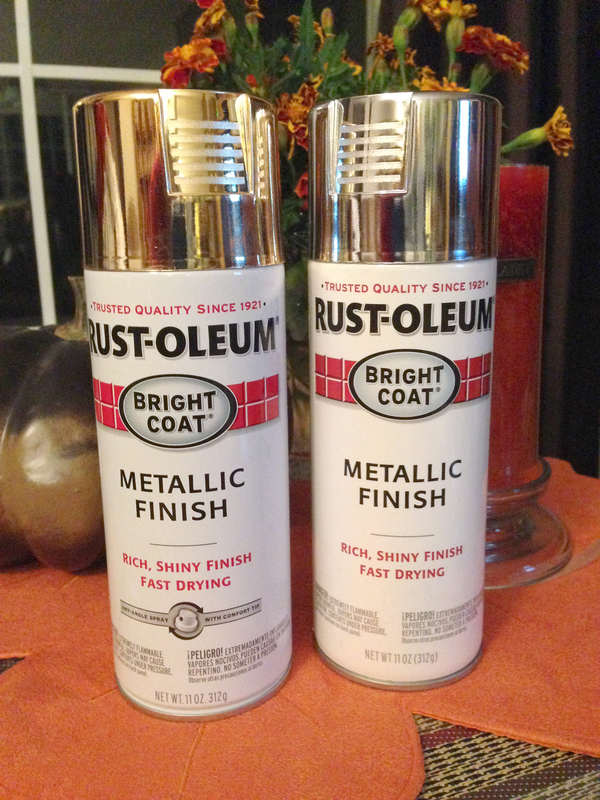 Here is the gold spray paint at Amazon (afflink) - Rust-Oleum Metallic Color Spray Paint. You know, it's like when you ask them to buy milk and bread and they come home with a grocery bag full of other stuff. Except my good doobie hubby thought of me and bought me something that thought would make me happy. I had a friend tell me recently that her favorite Mother's Day gift was a truck load of manure for the garden. Different strokes for different folks, for sure. He said he wanted to get me a DIY craft that I could do and write about quickly in order to be able to go to bed before midnight one night this week. I guess I have been burning the midnight oil a bit much lately working on this blog. 31 posts in 31 days have been quite the challenge. 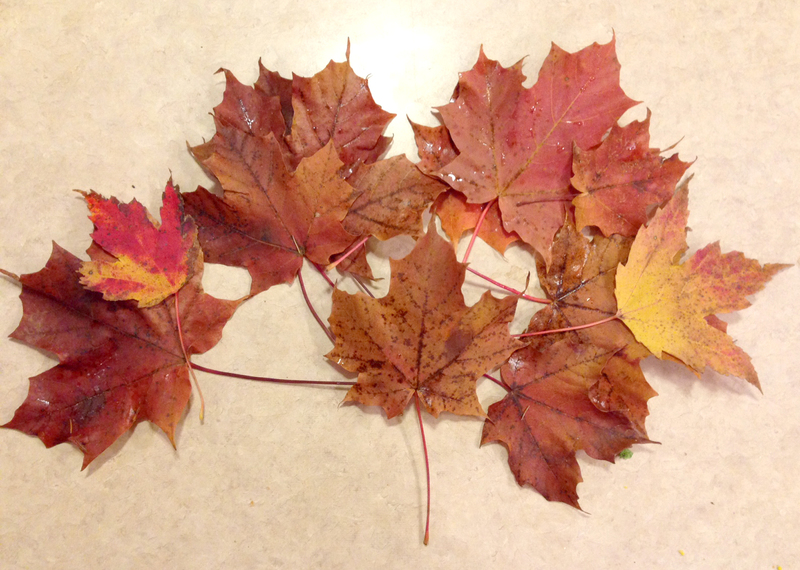 Here are the leaves I brought home today to do this project. Funny thing is, I was out shopping today and saw two really pretty maple leaves laying on a car in the Kohls parking lot. I said to myself, "Self, those would work really nicely for my gold and silver metallic leaf project!" So, I picked them up off the car, careful not to touch the car in case it had an alarm. As I was doing it, I was thinking "I must be nuts!" Anything for a DIY project, huh? Then I saw a bunch of leaves on the ground at El Mezcal, a Mexican Restaurant in Rib Mountain. I gathered a bunch up - I was so excited! Silly, right? It doesn't take much to get me excited. It's the simple things, really. My DH and I are working on canning grapes tonight, and in between the many steps of canning, I ran out and painted my leaves. I just painted one side so the leaf could dry out. I wasn't sure if the moisture in the leaf would bubble the paint, so I left one side paint free. I grabbed a couple of cardboard boxes and sprayed away. It was very simple. Since it is cold out tonight, I sprayed them and brought them inside to dry in the warmth. It wasn't long and they were dry. Here they are just laying on a red table cloth so you can see how pretty they are. 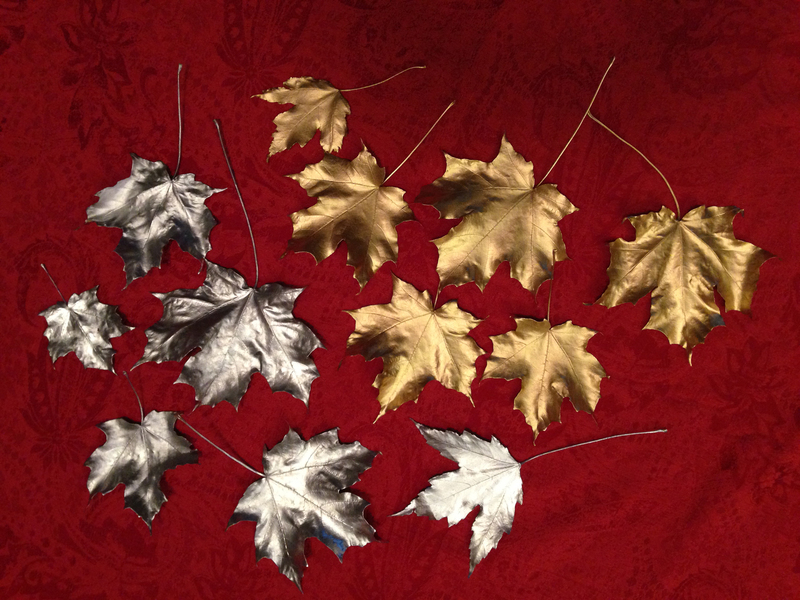 Tomorrow I will place my gold and silver painted leaves around my house as fall accents. I will be able to use them for Christmas decor also. 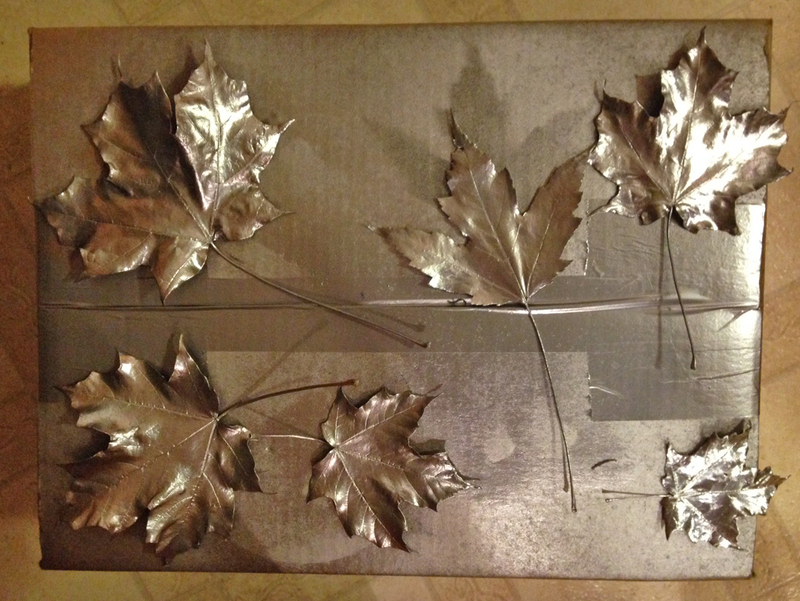 I looked on Pinterest to see if there were any projects with metallic leaves. 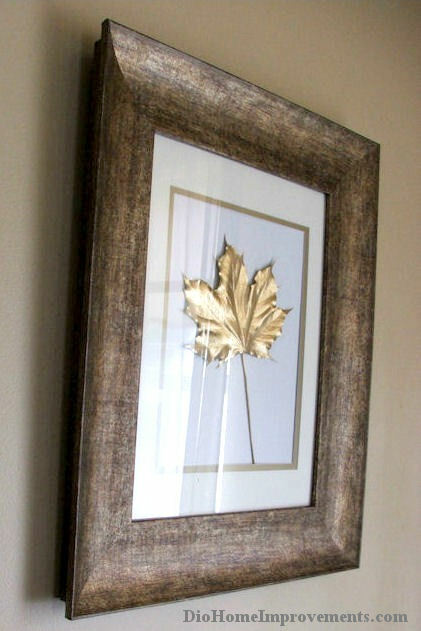 Here is a project from DIO Home Improvements where they framed the painted leaves. This was an easy project. What project are you working on? Canning Tomatoes for the First Time – DIY Fun!